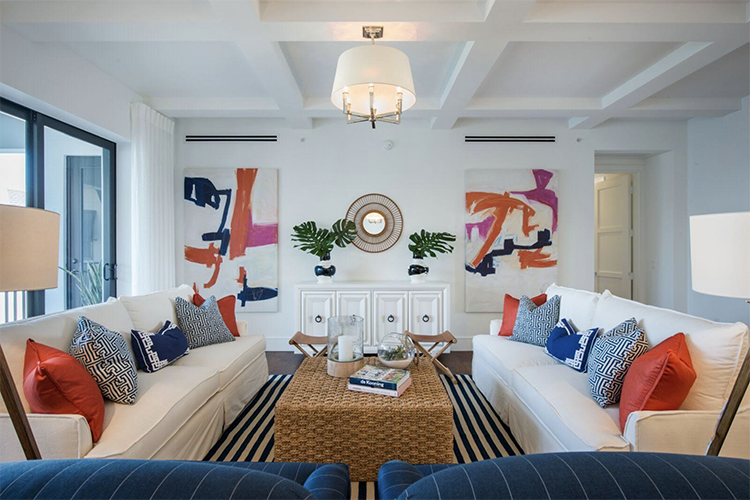 For the past two decades in sunny Naples, Florida, Renee Gaddis and her team of designers have given homes across the country a sampling of her coastal charm. Primarily focused in the sunshine state, her eye for tropical colors, sunset-welcoming windows, and spacious outdoor oases. This Friday, the shopping-obsessed designer told us a bit about herself. 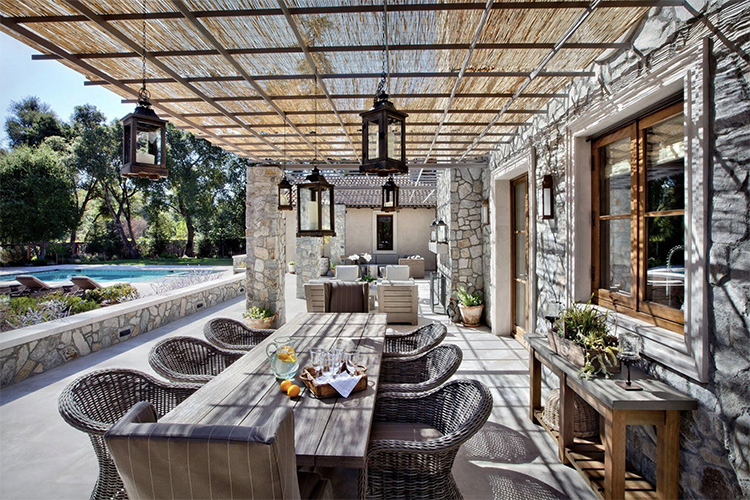 This intricately masoned pool deck is a summer afternoon dream. Andrew Joseph – How do you maintain a work/life balance? Renée Gaddis – I’m not sure I will ever be able to master this. Balancing work and family is one of my biggest challenges and never seems to get any easier. Andrew – Style (or design) icon? Renée – Olivia Palermo, she is perfection. Andrew – What are three things you can’t live without? Renée – My family, of course, my barefoot dreams blanket and a yummy Cabernet. Renée – The smell of fresh cut grass reminds me of summertime while growing up in Iowa. There is a nostalgia about the scent that always makes me stop what I am doing. 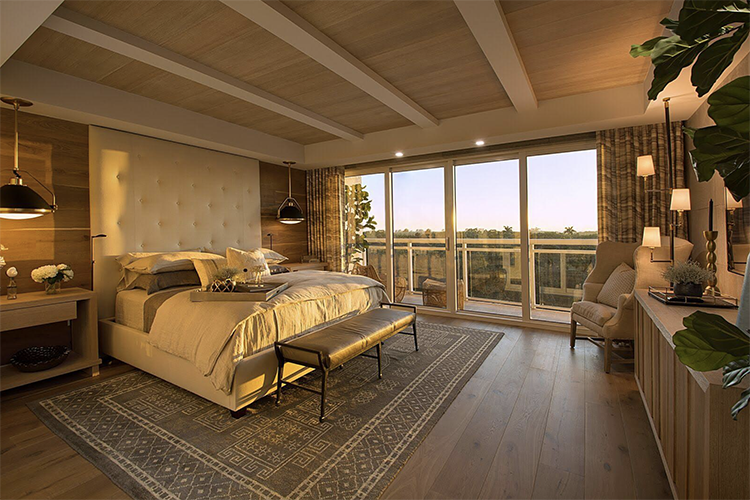 Golden hour never goes unnoticed in this balanced bedroom. Gaddis expertly selects colors for the space that complement the sun’s glow. Andrew – If you made a documentary, what would it be about? Renée – It was already made into a movie. Confessions of a Shopaholic but my rendition with my husband would definitely not be as romantic as the original. Andrew – Last piece of content you consumed that made you cry? Renée – The movie Crazy, Rich Asians. They claim it is a comedy but parts of the movie were very sad. Andrew – A song you can listen to on repeat? Renée – Time after Time by Cyndi Lauper and Leather and Lace by Stevie Nicks. An almost symmetrical sitting room is made fresh with complementing pillows and abstract canvases. 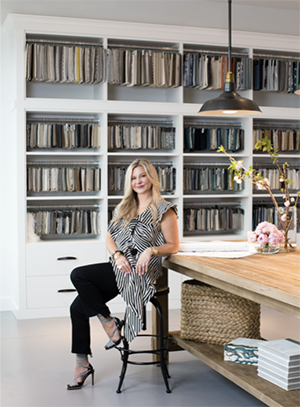 About Renée Gaddis | Renée Gaddis has been recognized as the region’s top interior designer for over a decade. Her designs attract and inspire the area’s leading residential properties, as well as top architects and home builders. Renée is known for her ability to work within a diverse lifestyle portfolio ranging from Coastal, Contemporary to Transitional along with creating unique commercial spaces. Her work has been written up in numerous magazines and accolades include being named Naples Interior Designer of the Year and Gulfshore Business’ 40 under 40. Renée is also a leading advocate for children with heart disease and spearheads fundraising efforts for research annually through the American Heart Association. About Andrew Joseph | Andrew Joseph’s passion for design and rich journalistic history led to the launch of his boutique PR firm in 2012. Prior to enjoying the successes of Andrew Joseph PR, Andrew honed his editorial skills at Vanity Fair and Allure. This experience, as well as the strong network of contacts developed over the years in public relations, brings a valuable edge to his new role as contributing editor. Let the musing begin. Like what you see? Get it first with a subscription to ASPIRE DESIGN AND HOME magazine. ASPIRE DESIGN AND HOME is seeker and storyteller of the sublime in living. It is a global guide to in-depth and varied views of beauty and shelter that stirs imagination; that delights and inspires homeowners as well as art and design doyens. Collaborating with emergent and eminent architects, artisans, designers, developers and tastemakers, ASPIRE creates captivating content that savors the subjects and transports with stunning imagery and clever, thought-provoking writing. Through lush and unique visuals and a fresh editorial lens, ASPIRE explores what is new and undiscovered in art, interiors, design, culture, real estate, travel and more. ASPIRE DESIGN AND HOME is an international narrative and resource for all seeking the sublime. © Copyright 2018 ASPIRE One Communications.